Remember when you bought your motorcycle? It looked so cool then and you could see yourself cruising the streets and freeways of Dallas and looking pretty cool yourself. You had a lot of fun on that bike, met some interesting people, had a few close calls and got satisfaction out of working on it yourself. You meet somebody, get married, have a kid or two and suddenly a two seat saddle just isn’t enough. You need something that carries everyone and has the cargo space for groceries. You need a car. But just because you add an automobile you don’t get rid of the motorcycle. You know you’ll still go cruising on it so you keep up the insurance and registration, except it turns out you really don’t use it all that much and it just takes up space in the garage. 2008 arrived and the Dallas economy, like economies in cities across the nation took a dive and it has been slow to recover. Maybe you find yourself in a financial squeeze even today. You cut your expenses as best you could but you still could use an influx of money into your slimmed down bank account. The next step is to sell off an asset you don’t need. You can’t sell your car for cash because it is the family’s transportation but there is that motorcycle sitting in the garage. If you are priced right you’ll get a lot of texts and you’ll have to make yourself available to show the bike. You’ll get some interesting people visiting your home. You will have lookieloos wasting your time and hagglers who can’t pay your price. When you find a buyer you want cash or better yet, a money order or certified check. You need to complete the paperwork required by the DMV. You hope the buyer isn’t the type to come back to you with complaints about the bike. There is an alternative that takes next to no time at all and sells your bike within a day. 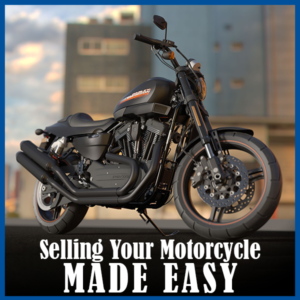 In Dallas, and in other major cities across the country there is a company that specializes in buying used motorcycles and other vehicles. IQ Auto Buyers will give you a quote over the phone or online for your motorcycle. If you like the price all you have to do is show up with the bike at the shop. A technician will look at it to confirm the condition that you listed and then pay you on the spot. Your biggest concern is having a ride to take you home. Sell your bike in one day without any of the hassle of selling it yourself!